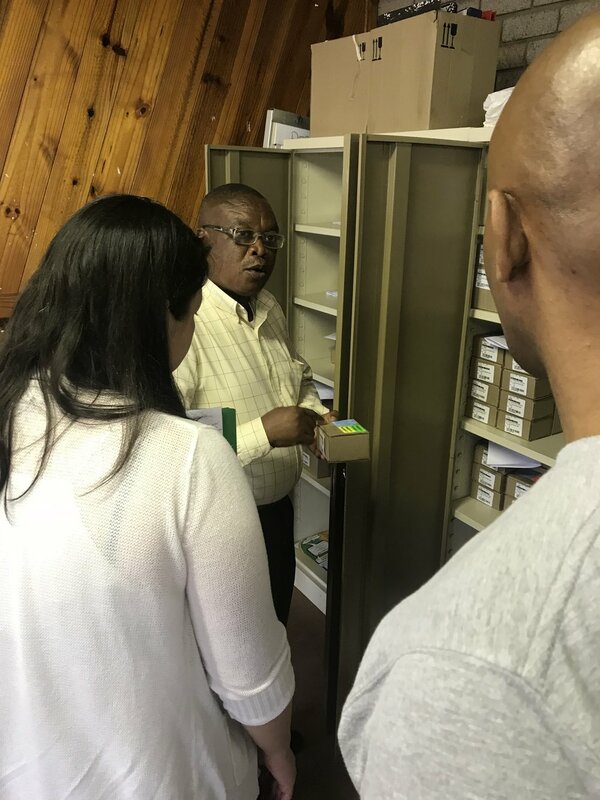 Dr. Miranda Law, a pharmaceutical supply chain and logistics expert from Howard University, traveled to Durban the week of February 25th to provide consultation to NCD-LINK project partners as screening activities kick off in Umlazi this month. Dr. Law visited 4 of the project facilities during her time in Durban and spoke with patients, nursing staff, pharmacy assistants, and facility managers. Dr. Law worked with patients and personnel to better understand the existing practices for managing and dispensing medicines, educating patients about their medicines, utilizing community pick up points. The project team plans to incorporate findings from this work to strengthen existing plans and build opportunities to support the Department of Health in its priorities to integrate service delivery across disease areas. Dr. Law also presented on the importance of healthy eating and medication management to a group of over 45 participants at the NCD-LINK workshop held in Durban. This workshop was hosted by IRD-South Africa, implementation lead for the NCD-LINK project, and focused on the integrated care model for screening and linking patients to treatment for tuberculosis (TB) and non-communicable diseases (NCDs). This workshop was attended by program staff, dieticians, nursing managers from project facilities, district coordinators from KwaZulu-Natal, and the KwaZulu-Natal Provincial Director of NCDs, among several other key leaders from the Department of Health for NCDs and TB. The workshop and Dr. Law’s visit occurred in preparation for the official kick-off of activities for NCD-LINK, a collaborative project between Advance Access & Delivery, IRD-South Africa, the Lilly Global Health Partnership, the South African Medical Research Council, and the South African Department of Health to conduct community-based, integrated screening and linkage to care for TB and NCDs including diabetes and hypertension. Pharmaceutical care serves as a vital element to the success of the NCD-LINK project. This trip highlighted the need to better understand how the existing pharmaceutical care system operates as the project considers opportunities to provide support to staff and patients across several core project areas including patient education, use of community pick-up points to collect medicines, enrollment of patients on chronic medication dispensing programs, and supporting facility and project staff as they roll out integrated screening and linkage to care programs in Umlazi. This project presents a critical opportunity to support the Department of Health in its efforts to screen and link patients to treatment in eThekwini. The lessons learned from Dr. Law’s visit and from the NCD-LINK project will be shared widely with partners at both the District and Provincial Department of Health to inform integrated health care delivery in Durban and beyond. TB HIV Care provides critical support and harm reduction resources for Durban’s growing drug user community. AA&D is partnering with MASS Design to develop a set of design criteria and recommendations for improving the spaces and services provided to drug users and homeless individuals living in Durban, South Africa. The City of Durban has embarked on a fast-track mission to address the needs of drug users and homeless individuals living in the Central Business District. Part of this plan is to improve existing facilities and expand services to meet the needs of this growing population. Over the last six months, AA&D and MASS have engaged in working discussions with city officials including the Deputy Mayor and the City Manager and partners from Durban University of Technology (DUT) and TB HIV Care to discuss the philosophy and architecture needed to meet the needs of Durban’s growing drug user community. A general consensus was reached through these deliberations that an integrated centre should be established for low-income and homeless people with a substance-use disorder. This interdisciplinary partnership between AA&D, MASS Design, DUT, TB HIV Care and the City of Durban presents an opportunity to apply evidence-based interventions to meet the unmet needs of drug users and homeless individuals in the city with the overall aim of reducing the harms associated with drug use for individuals, their families, and the community. AA&D and MASS Design have been asked by city officials to contribute to a comprehensive brief that will inform design criteria and recommendations for the improvement and development state-of-the-art facilities to treat opioid addiction and deliver comprehensive harm reduction services. This work, spearheaded by AA&D Partnerships Lead Michael Wilson, builds on AA&D's past work to extend access to life-saving harm reduction resources including naloxone. AA&D and MASS are currently engaged in discussions with drug users, social workers, and service providers across the wider Durban metro area to understand the impact of structural space on the delivery of care and support for this population. University of Garmian researchers, Dr. Pegah Seidi and Nazdar Qudrat, visited a camp for internally displaced persons in Duhok, Iraq as part of an interdisciplinary project to understand gaps in care for mothers and children displaced by conflict. In November of 2018, researchers from University of Garmian visited a camp in Northern Iraq for Internally Displaced Persons (IDPs). This visit is part of a multi-disciplinary research project supported a team from AA&D and UNC Chapel Hill to understand the gaps in medical and mental health care delivery for mothers and children displaced by conflict. Ultimately, the goal is not just to understand these needs, but to act upon them in a spirit of solidarity. The information gathered through this initial work will be used to inform future support for people in IDP camps, and similar post-conflict settings. Currently, this research project seeks to understand mental health challenges and improve services for mothers and children of the Yazidi community who have been displaced by conflict in the country. Yazidis are an ethno-religious minority who have suffered extensively in past and ongoing conflicts in Iraq. More than one tenth of Iraq’s population, or more than four million people, is estimated to be internally displaced, and more than 7.5 million Iraqis are estimated to experience profound mental trauma as a result of the ongoing conflicts in the country. Many of these affected communities have faced historic persecution as ethnic or religious minorities in Iraq, and the ongoing physical and mental health challenges as a result of violence and persecution are particularly acute. The team, which includes Dr. Dilshad Jaff and Dr. Aunchalee Palmquist at UNC Chapel Hill, Dr. Pegah Seidi and Nazdar Qudrat of the University of Garmian, and Tom Nicholson, Michael Wilson, and Amanda Brumwell of AA&D, has been working together since spring of 2018 to understand mental health challenges, as well as the gaps in care to address these, among IDPs in complex emergency settings. Dr. Seidi and Ms. Qudrat visited a camp of nearly 4,000 IDPs in Duhok, a city located in Iraqi Kurdistan where they conducted interviews with mothers of infants about their views on access to perinatal and postnatal medical care, mental health services, and gaps in the delivery of these important healthcare services. The University of Garmian-based research team also administered surveys to understand the level of trauma and depression among displaced mothers. The goal of this project is to gather evidence of the ongoing but overlooked trauma and mental health concerns among this population while prioritizing maternal and infant health. Researchers hope that the findings from this project will translate to more inclusive health delivery pathways that integrate maternal and child health with mental health for severely traumatized mothers and infants. The group plans to continue data collection and analysis throughout 2019, visiting several camps across the region during this time. Team members are optimistic that the findings from this research can inform meaningful changes to the delivery of care for displaced mothers and children in complex emergency settings. 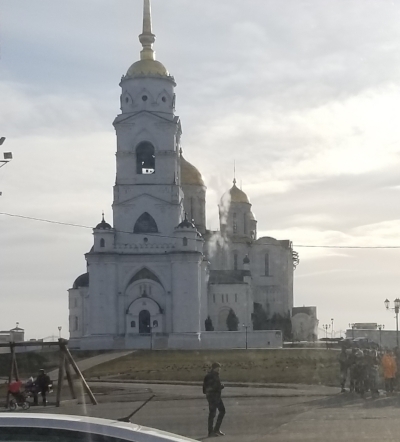 On November 10, AA&D Executive Director Tom Nicholson visited the cities of Moscow and Vladimir in the Russian Federation as part of AA&D’s work to understand and address barriers to care for people with Hepatitis C (HCV). In fall of this year, AA&D received funding to support a scoping project to understand the epidemiology of HCV in the Russian Federation and develop an actionable plan to address barriers to treatment for this disease. A core component of this work is to identify potential future paths for importation and delivery of direct-acting antivirals (DAAs), which are life-saving drugs that can cure what was once a chronic disease. 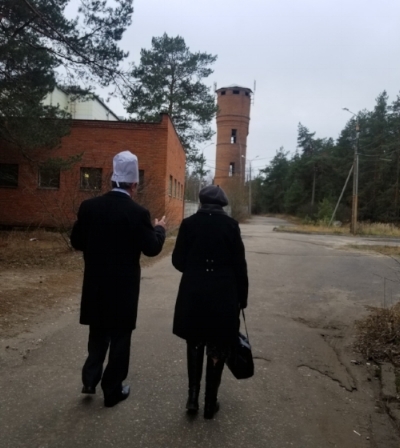 Nicholson visited Vladimir, a city of about half a million outside of Moscow, to meet with doctors, patients and former patients, policymakers, and leadership from local NGOs. The goal of this visit was to understand the scope of the HCV epidemic in Russia, as well as the challenges and opportunities related to logistical and financial barriers to patients benefiting from these new drugs. An estimated 6 million people in Russia suffer from HCV, and the disease coincides with social and medical co-morbidities that can challenge access to effective care. Less than 2% of people receive care. And if treatment is received through the public sector, it is typically with older, less effective medicines. The reasons for limited access to treatment are complex, but include a limited selection of treatments that are registered in-country, as well as stigma related to social factors (e.g. drug use). The cost of treatment for HCV in Russia and in much of the rest of the world is often prohibitively expensive, forcing people to resort to other treatment options with questionable efficacy and safety. Compared to only a few years ago, the advent of DAAs has opened the opportunity to reverse the epidemic of HCV if comprehensive, cost-effective methods for care delivery can be identified and implemented. Nicholson’s visit was focused on addressing barriers to effective treatment, with the goal of securing funding for ambitious projects that deliver high-quality care for patients. This work is an important step towards developing solutions for this pressing global health challenge in the near future. On Monday, November 12th, team members from the Kenan Biddle Refugee Initiative held a workshop at the Center for New North Carolinians (CNNC) in Greensboro, NC. Over the past year, Kenan Biddle Refugee Initiative team members have worked with service providers, community health workers, volunteers, and refugee community members to develop a training handbook for people working to serve the refugee community and improve access to much-needed services. The purpose of the workshop was introduce a draft of the handbook to people who interface between service providers and community members, understand the strengths and shortcomings of the handbook, and find opportunities to improve based on the experiences of workshop participants. The handbook development and workshop are funded by the Kenan Biddle Partnership, a joint funding opportunity between the University of North Carolina at Chapel Hill and Duke University to support collaboration between students from both schools to engage and support the Triangle Area community. Over the past year, AA&D and its partners at Refugee Community Partnership (RCP), CNNC, and other North Carolina-based service providers have collaborated to understand the landscape of services that are available and accessible to refugee communities. The handbook is expected to be finalized in December 2018 and shared with partners in response to expressed need for comprehensive training for community health workers, resource navigators, volunteers, and other people working to support the communities in North Carolina. The workshop was hosted by the CNNC, a University of North Carolina at Greensboro center to promote access and integration for refugees and immigrants in North Carolina. CNNC aims to improve the delivery of services for newcomers to North Carolina while conducting trainings and research to further support North Carolinian communities. More information on the Kenan Biddle Partnership, CNNC, and RCP and their programs are available on their sites. AA&D Executive Director and research partners met with Nobel Laureate Nadia Murad and fellow activist Abid Shamdeen on October 29. On October 29, Nobel Peace Prize Laureate Nadia Murad spoke as a part of the Crown Lecture Series in Ethics at Duke University. Nobel Laureate Murad spoke about her work to end sexual violence as a weapon of war. As a member of the ethno-religious Yazidi community from Northern Iraq, she knows of the lasting trauma to individuals and the community that such crimes can cause. In the face of intensified persecution in recent years, she has founded a nonprofit, Nadia’s Initiative, as a platform to advocate for women’s and minorities’ rights, especially in emergency and crisis settings. AA&D, in its partnership with Duke, initiated the work to bring Nobel Laureate Murad to the Triangle. The Crown Lecture event was a successful push to shed light on the urgent humanitarian crisis in Iraq. Already, AA&D and its partners at UNC Chapel Hill and Garmian University have established a research project to understand mental health needs and challenges in maternal and child service delivery among the Yazidi. This research began in mid-2018 among mothers and children in internal displacement camps. Looking ahead, this consortium hopes that momentum will continue to build attention and action to address the crisis facing thousands of Yazidis. More information about the event can be found at the Sanford School of Public Policy’s feature here. Nobel Peace Prize Laureate Nadia Murad is set to speak as a Crown Lecturer at Duke University on October 29. As a member of the ethno-religious Yazidi community from Northern Iraq, she has been lauded for her work to end genocide and sexual violence, especially as a means of war. The Yazidi community has faced historic persecution and violence that has intensified in recent years. Her own experience of violence at the hands of ISIS has fueled her work to start a nonprofit, Nadia’s Initiative, as a platform to advocate for women’s and minorities’ rights, especially in emergency and crisis settings. This event coincides with Advance Access & Delivery’s newly established project with researchers at UNC and Garmian University to understand mental health needs and maternal and child health challenges among the Yazidi in Iraq. This consortium hopes that this event will foster growing attention and action to address this urgent humanitarian crisis. AA&D, in its partnership with Duke, started the push to bring Nobel Laureate Murad to the Triangle. She will give the 2018 Crown Lecture in Ethics at Penn Pavilion from 5:30-7:00pm on Monday, October 29, followed by a reception and book signing. More event details can be found here. AA&D is among a team of researchers and global health practitioners who have partnered across North Carolina and Iraq to improve the delivery of critical health services for internally displaced persons (IDP) in Iraq. This research project, “Closing the Delivery Gap for Internally Displaced Mothers and Children in Fragile Contexts: Perinatal Mental Health, Infant Feeding Practices and Malnutrition in Iraq,” seeks to understand and improve mental health services for Yazidi mothers and children who have been displaced by conflict in the country. Yazidis are an ethno-religious minority who have suffered extensively in past and ongoing conflicts in Iraq. Currently, most of the population is in displacement camps in Iraqi Kurdistan, and they lack access to basic services including medical care. The immediate and lasting effects of trauma are well-documented among the Yazidis, especially among women and mothers, yet there is little work being done to address this urgent need. Alongside AA&D and included in this team are Dr. Aunchalee Palmquist, a UNC Chapel Hill assistant professor of maternal and child health and member of the Carolina Breastfeeding Institute, and Dr. Dilshad Jaff, adjunct assistant professor of maternal and child health and program coordinator for solutions to complex emergencies in the UNC Gillings School’s Research Innovation and Global Solutions Office. In Iraq, Dr. Pegah Seidi and Nazdar Qudrat Abas, both of the University of Garmian College of Education’s Department of Psychology, will collaborate in this project’s research and in-country implementation among IDP camps. The goal of this project is to gather evidence of the ongoing trauma and mental health concerns among this population while prioritizing maternal and infant health in a complex emergency setting. This research will translate to more inclusive health delivery pathways that integrate maternal and child health with important, but overlooked, mental health support for severely traumatized mothers and infants. “We are honored to take part in this work with UNC and Garmian University, to understand how to support these communities that have been through so much suffering and strife in recent years. This is a modest first step to identify how to assist in the provision of health care and social services to these Iraqi communities, in a spirit of solidarity and respect,” says Tom Nicholson, AA&D executive director. A news announcement for this project from UNC Gillings School of Public Health can be found here, and an announcement from the Duke Center for International Development here. The Zero TB Initiative has “pushed beyond cynicism to forge a new consensus” towards comprehensive strategies to eliminate tuberculosis (TB), according to the New York Times editorial board. The Zero TB Initiative, a global coalition of non-profits, research institutions, public and private entities, and patient advocacy groups, seeks to eliminate TB globally through its comprehensive approach. This “Search-Treat-Prevent” strategy emphasizes the need to search actively for people with TB, extend treatment all people who need it, and prevent further transmission and progression of the disease. The Times article highlights the urgent need for action to eliminate this disease, which kills more than 1.8 million people annually, as well as recent successes in the fight to end TB accomplished by ZTBI partners. In light of the recent United Nations General Assembly meeting on September 26, which is one of only a handful of General Assembly meetings devoted to a single disease, there is new pressure on policymakers to direct much-needed resources towards researching and implementing effective strategies to combat TB. An NYT Editorial Commentary is an important spotlight on not only the seriousness of the problem that TB presents, but also the clear way forward that has been successful when implemented in the past. The full article can be viewed here. Durban, South Africa -- On July 9th, over 350 individuals from government, civil society, and the international community joined the Kwamakutha community in the South-Central sub-district of eThekwini to launch a 5-year linkage to care project for tuberculosis (TB) and noncommunicable diseases (NCDs). The event highlighted the importance of integrating screening and treatment for NCDs within the existing TB and HIV services in eThekwini. The event was attended by several high level officials from the National, Provincial, District Departments of Health as well as from the Municipal Health Office, including a keynote speech from Sibongiseni Dholo, MEC KwaZulu Natal. This 5-year project, called NCD-LINK, is supported by Lilly Global Health and will be implemented in 10 public facilities across Umlazi, a sub-district of Durban. The project will be carried out by Advance Access & Delivery (AA&D) and its partners at Interactive Research & Development-South Africa (IRD-SA) and the South African Medical Research Council will lead the project’s monitoring and evaluation arm. NCD-LINK will build on TB and HIV infrastructure in KwaZulu Natal as a platform for screening and treating NCDs. The goal of the project is to expand access to these important medical services and hasten the delivery of care that people need. Participants of this event were offered screening for TB, HIV, diabetes, and hypertension. Screening was provided by local teams from IRD-SA, the District Department of Health, and the Municipal Health Office. Project activities will begin later this year and will support the National Service Integration agenda as well as the National Wellness Campaign in which eThekwini is one of the high-burden sub-districts identified. On Tuesday, a group of over 50 people marched in solidarity along Durbans south-central neighborhoods, raising awareness of the citys recent decision to suspend the only legal needle syringe program (NSP) in Durban. Led by a local branch of South Africas Network of People Who Use Drugs, this peaceful demonstration brought together members from civil society, the local university, drug users, media, and members of law enforcement to show their support for a critical public health program serving the entire community’s interest to be a healthy, resilient city. As participants danced, raised their voices, and sang traditional isiZulu songs of struggle, several onlookers said that they too knew someone who has become sick or even died because of sharing needles. The city stated that a trade permit must be issued before the program resumes activity. The concern suggested was that needles and other materials provided by NSP programs pose a health risk to the community and that a proper disposal plan must be outlined before the program is reinstated. 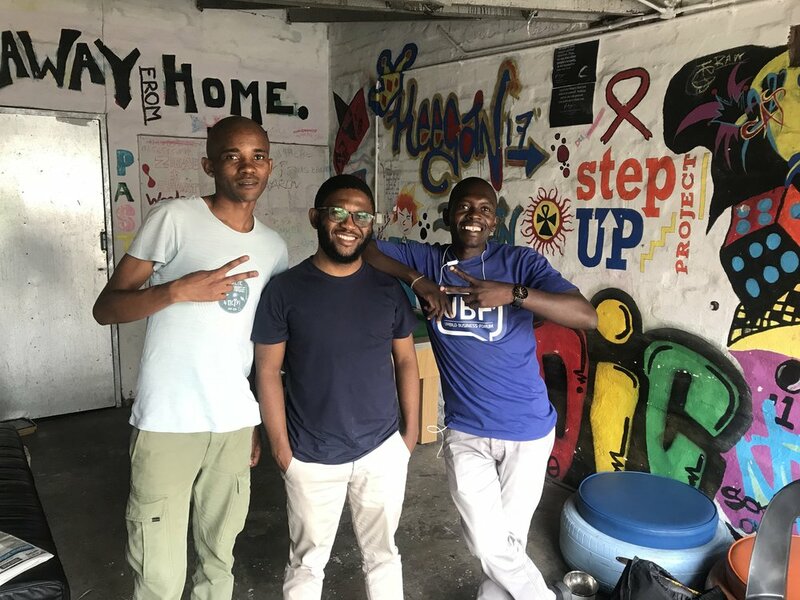 The NSP, started by Monique Marks, a professor and human rights advocate who heads the Urban Futures Center at the Durban University of Technology, has served as a critical resource for over a thousand drug users seeking clean needles, counseling, and peer support. Following the march, members of the TB/HIV care network and the Urban Futures Center delivered a public statement and petition to the Mayor’s office requesting that the NSP be reinstated as a critical program to support drug users, their families, and the communities where they live and work. It is with great sadness that we at AA&D note the passing of our friend Aaron Plourde, who worked as our media officer from 2016-2018, from cancer. He was a generous, conscientious, and devoted friend who had a drive to help others in his work, from carpentry to communications, the wellbeing and happiness of others was at the front of his mind. In his spirit, we hope to continue to spread a message of hope and optimism in our work. Aaron leaves behind a wonderful family-- his wife Julia and two children. Please consider donating in his memory to his youcaring site -- given the family’s long and costly battle against his cancer. We will miss Aaron deeply. In March of 2018, Advance Access & Delivery (AA&D) and the Lilly MDR-TB Partnership launched the first of its kind, web-based platform, the TB Drug Access Atlas. This tool highlights over 40 global projects addressing challenges related to the supply and access of quality-assured, second-line drugs for MDR-TB. This interactive platform gives users a first hand look at the burden of MDR-TB at the global and country levels and showcases projects that are working to address one or more of the following seven market indicators: affordability, delivery challenges, forecasting, market incentives, procurement, regimen complexity and regulatory complexity. One of the intended outcomes of this tool is provide a snapshot of where opportunities exists to leverage resources in a direction that will improve access to medicines for those most in need. Projects captured on the TB Drug Access Atlas represent activities ongoing or planned between 2014-2020. The database is organized by market indicator and geography and will be updated at regular intervals throughout the year. Please send any questions or comments to tbatlas@advanceaccessanddelivery.org. Members from the Kenan Biddle Partnership team met with a group of community health workers that are supported by the Center for New North Carolinians (CNNC) as part of ongoing discussions to better understand the challenges faced by refugees and immigrant communities when accessing healthcare and social services across the state of North Carolina. This project is supported by The Refugee Community Partnership, a community-driven organization based in Carrboro, NC focused on intentional support for relocated families in North Carolina and Advance Access & Delivery, a non-profit based in Durham, NC committed to fighting double standards in healthcare policies and access to medicines. The project aims to create a robust set of training materials that can be used by community organizations working to accompany individuals and families that are new to North Carolina. Through a series of interviews and focus groups, team members have met with volunteers, community health workers, and the leaders of refugee support programs to hear first-hand how they are addressing service barriers within their communities. The team will use this information collected to create a training package to be shared widely with community partners. The team’s meeting in Greensboro explored the complexities that are often faced when working with refugee and immigrant communities to access even the most basic healthcare services. Several of the community health workers underscored the importance of resourcefulness, flexibility, and compassion in their roles. AA&D, in partnership with students and researchers at Duke University and the University of North Carolina - Chapel Hill, are working on an initiative addressing health and wellness among refugee communities in the Triangle area thanks to a Kenan-Biddle Partnership grant. While many state-supported services are available upon arrival, few are sustained beyond the first six months. Long-term, community-based support for refugee communities is often patchwork at best, leading to significant gaps in access to critical health and social services. This collaborative initiative aims to address these issues to improve overall refugee services. The TB Drug Access Atlas is an interactive, web-based tool for mapping the supply and access of quality-assured, second-line drugs for MDR-TB. This tool presents the burden of MDR-TB at the global and country levels, and highlights work currently being done or planned around the following seven market indicators: affordability, delivery challenges, forecasting, market incentives, procurement, regimen complexity and regulatory complexity. On October 28, the capital of Bangladesh became the latest city to sign onto the Zero TB Cities Initiative. Advance Access and Delivery, is the current secretariat for the initiative, alongside other founding partners at Interactive Research and Development, Harvard Medical School, and the Stop TB Partnership at the UN. Partners In Health, Interactive Research and Development and the Zero TB Initiative welcome the release of interim results from STREAM Stage 1 clinical trial, which was conducted to study a new treatment regimen for multidrug-resistant tuberculosis (MDR-TB). With the enormous burden across the world of both infectious diseases and non-communicable diseases (NCDs), health delivery programs need to be flexible but purposeful to address the multiple health challenges faced by individuals and communities. Despite much rhetoric about health systems strengthening and integration of health care services from national, international, and local health delivery programs, the detailed considerations in terms of policy and practice for even one area of this inquiry are many and complex. A newly published report titled “Toward comprehensive global health care delivery: Addressing the double threat of tuberculosis and diabetes” offers examples and supporting data of settings where comprehensive programs are providing, or could provide, successful solutions to combatting multiple diseases in a way that is focused on patient care, efficiency, and strategic harmonization. This report focuses on diabetes, probably the largest public health challenge of the next several decades, and how it intersects with tuberculosis, the leading infectious killer of adults in the world. With support from the Lilly Foundation, AA&D led a team of health delivery experts, academic faculty, and graduate researchers from Duke University Sanford School of Public Policy, University of North Carolina Eshelman School of Pharmacy, Partners In Health Russia, Harvard T.H. Chan School of Public Health, and Harvard Medical School Department of Global Health & Social Medicine in the writing and preparation of this report. The authors focused on TB and diabetes, two disease areas in the top ten killers globally, to illustrate how even in a single overlapping and crucial area of global health care, the need for service integration, community-based solutions, inter-departmental and interdisciplinary cooperation, and quality improvement are pervasive and interconnected. They argue that a comprehensive platform is urgently needed to address global health challenges in coordinated fashion, rather than in administrative, academic, and institutional isolation. For first time, heads of state include TB as a health priority during this year's G20 summit in Hamburg, Germany.